The ZMP Co., Ltd. (Bunkyo Ward, Tokyo, CEO: Taniguchi Hisashi , hereinafter "ZMP") announced that in the "Mitsui Foods Food Show" sponsored by Mitsui Foods Co., Ltd. on Wednesday, June 20 to 21, 2018 ", we will exhibit the logistic support robot" CarriRo® ". At this exhibition, we will demonstrate the traction of a six-wheel truck (slim cart) with a towing option, which began shipping last month with the latest 2018 model CarriRoⓇ. CarriRo ® is a product developed by applying ZMP's Autonomous Driving technology to a boggie. It is effective due to picking operations of logistics warehouses, inter-process transportation in the factory, logistics inside the stations, airports, and commercial facilities for the purpose of reducing transportation workload, saving labor and efficiency. The towing option is CarriRo®'s exclusive attachment, which can tow a hexagonal trolley (slim cart) and basket car. By utilizing the towing option with CarriRo ® 's Karugamo function, workers will be able to carry trucks loaded with heavy loads by walking ahead of CarriRo ®. At this exhibition, we will demonstrate CarriRo® to tow a six wheel trolley (slim cart). ※ Visitors must bring their invitation cards. Please contact ZMP for consultation on the visit. 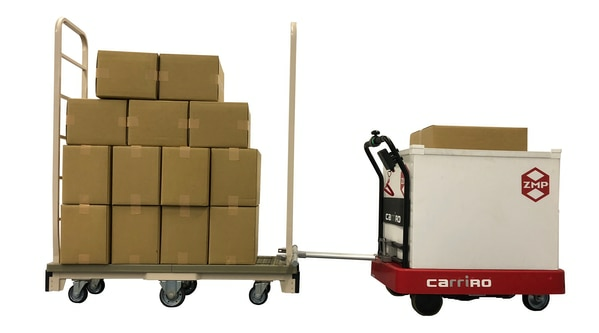 CarriRo ® is a cart type logistics support robot with a drive mode that allows operation with a joystick and a karugamo mode that automatically tracks a beacon (transmitter), and is a product that began selling in August 2016. By utilizing the function of CarriRo®, we aim to raise the productivity of transportation up to about 3 times. 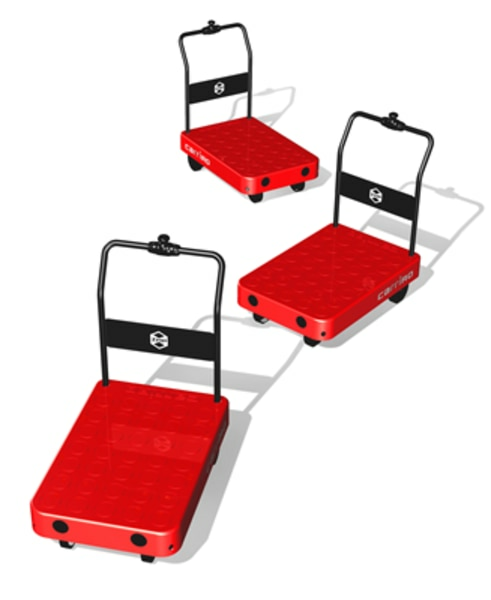 The rechargeable which can carry maximum of 150 kg baggage can be transported for 8 hours continuously, and efficiency in picking operations in warehouses and logistics centers can be improved, and when used for conveyance between steps in the factory, belt conveyors and AGVs (automatic guided vehicles).Moreover, since the work load is greatly reduced, it becomes possible for women and elderly people to carry out the transportation work which was regarded as hard labor so far, so it can be used for expanding workers and promoting employment. * Depends on road condition and the situation of the trolley.